Aladdin was always my favorite Disney movie so this year I decided to be Jasmine. 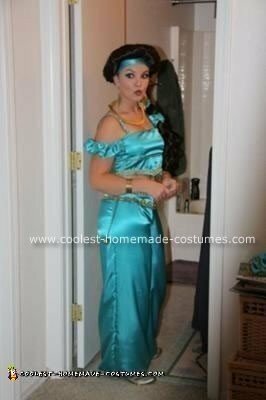 My Grandma is very good at sewing so I asked her to make my homemade Jasmine costume. We found a pattern for genie type outfits. I bought some teal satin-like material from Hobby Lobby. For the earrings I used gold Christmas ornaments and for the necklace I used some craft foam and painted it gold. I bought the wig online for about $25. I found some gold flats at Payless for about $15. Where did you find the wig?